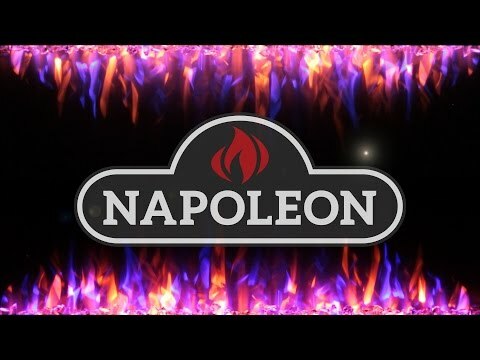 Create a home environment designed to make living easier with electric fireplaces from Napoleon. The clean face 33-inch electric fireplace features WhisperQuiet fan and heater with modulating control, reliable high power LED technology with realistic flames, and a natural looking log set with non-reflective backing for optimal flame viewing. Fading logs and ember bed resemble a dying fire when the fireplace is turned off. Customize your fireplace by choosing from one of four color settings for the flame Night Light. The included remote allows you to adjust the fan, set the temperature, use the timer to control the time of use, turn the fireplace on or off, and adjust the heat output and flame intensity from the comfort of your chair or across the room. The electric fireplace heats from the top of the unit to allow you to recess the fireplace into a wall or use it in a mantel application. With up to 5,000 BTUs, this 1500 watt electric fireplace is suitable for any room in your home. With no emissions or pollution, this energy efficient fireplace is EPA approved for overall maximum heating efficiency, which means you can achieve more heat with substantially less fuel. Napoleon delivers safety through functional products that have been both CSA and ANSI certified.